A few months ago, I shared what a printer’s plate is and how to get it. These plates make for nice silent auction items because they are unusual. When she read the post about printers plates, she asked one of her auction team members to follow-up with her local newspaper. The newspaper sent both of these to the nonprofit — two beautiful historical plates with copies of the front page framed. These plates were different than what I’d seen donated from The Wall Street Journal. These were more contemporary-looking and printed on a slick surface that seemed to be a plastic but almost resembled a metal. Final numbers are still out, but early results indicate that the auction-related activities raised twice as much as in year’s past. They also hit a new attendance record. 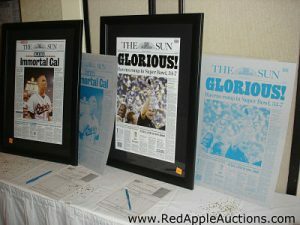 Making money at a benefit auction is simply a matter of using a proven system. To a degree, you can skate by on free ideas … but to take it to the next level as this group did, I invite you to reach out for consulting or onsite auctioneering services.